Mildred “Millie” Holtan, 90, died Thursday (May 24, 2018) at Field Crest Care Center in Hayfield, MN, surrounded by her loving family. Mildred Louisa Jensen was born on November 14, 1927, the daughter of Torkild and Margie (Farrar) Jensen in Kasson, MN. She attended Kasson schools, graduating from Kasson H.S. in 1945. She was united in marriage to Ernest (Ernie) Holtan on June 9, 1946, in Kasson, MN. Millie and Ernie farmed northeast of Hayfield, where they raised their family and lived for many years. In addition to being a farmwife, mother, and homemaker, Millie worked as a bookkeeper for the Hayfield Co-Op and later for Folkestad Chevrolet Garage and Hiawatha Tool in Kasson for many years. Ernie was a longtime Hayfield area farmer. Following their retirement, the Holtans lived both in Kasson and Hayfield. Ernie died on September 23, 2004. 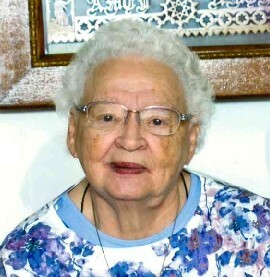 Millie was a longtime member of Trinity Lutheran Church in Hayfield and was active with various church activities. She enjoyed her children, grandchildren, and great grandchildren as well as reading, sewing, adult coloring, crossword and jigsaw puzzles. Millie is survived by five daughters - Linda (Doug) McCarty of Byron,MN; Elaine (Jary) Gardner of Kasson; Patricia (Bob) Lindstrom of Sartell,MN; Joyce (Jeff) Bakkedahl of Hayfield and Valerie (Mark) Distad of Spring Valley, MN; two sons - Steven (Vanessa) Holtan of Rochester,MN and Larry “Fuji” Holtan of Hayfield; four brothers - Harry (Sandy) Jensen of Minneapolis,MN; John (Joan) Jensen of Kasson; Laurence (Brenda) Jensen of Sumner,WA and James (Judy) Jensen of Rochester,MN; 19 grandchildren, 33 great grandchildren and special friend - Martin Hardy who provided companionship and support during the last months of Millie’s life. She was preceded in death by her beloved husband, Ernie, her parents, two infant granddaughters and two infant great-grandchildren. The Holtan family extends their heartfelt thanks to the staff of Crestview Villa, Fieldcrest Care Center, and St. Croix Hospice for their loving support and care of Millie. The funeral service will be at 11:00 A.M. on Wednesday (May 30, 2018) at Trinity Lutheran Church in Hayfield with Rev. Paul Hauschild officiating. Burial will take place in Fairview Cemetery in Hayfield. Friends and family may call from 4 to 7:00 P.M. on Tuesday (May 29, 2018) at Trinity Lutheran Church in Hayfield and one hour before the service at the church on Wednesday morning. Millie‘s family prefers memorials to be the donors’ choice.